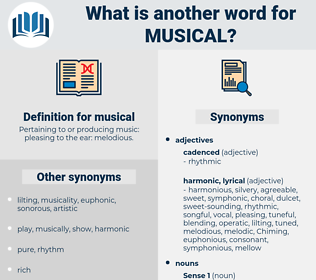 What is another word for musical? Pertaining to or producing music: pleasing to the ear: melodious. 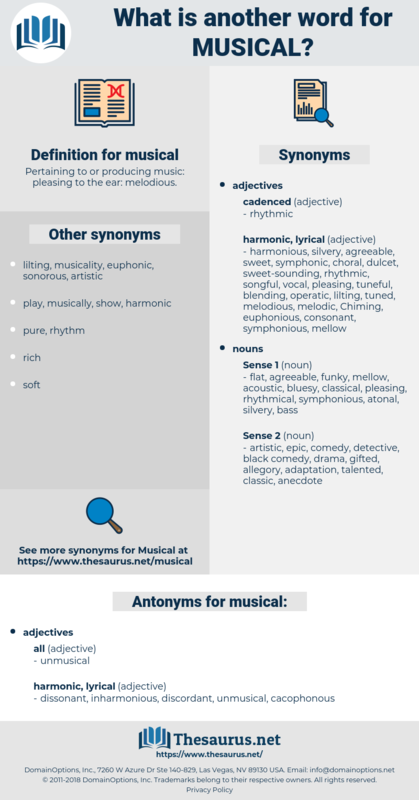 disconnected, shrill, atonal, harsh, blaring, scratching, staccato, disagreeable, clashing, screeching, nonmusical, jangling, unpleasant, squeaky, strident, disharmonious, tuneless, jarring, off-key, clattering, raucous, metallic, unpleasing, clanging. We could do something musical, easily. What splendid musical evenings you can have. miscall, mickle, mamoncillo, macula, magically, monongahela, moon shell, mawkishly, macaulay, mesial, monocycle, measly, megachile, missile, Mukalla, Minke Whale, mensal, mosul, mess hall, mizzle, makalu, Mock Azalia, messily, mokulu, muzzle, mongolia, mangle, misally, music school, moonshell, mescal, mccauley, magical, Mohs Scale, Megillah, megacycle, macushla, meningeal, moghul, missoula, mislay, majuscule, mecholyl, maxilla, mingle, mogul, michael, micelle, mongol, musial, mugil, manacle, monocle, muckhill, minuscule, music hall, mexicali, meekly, muscle, macleaya, mackle, macule, mew gull, mussel, mainsail, musically, muesli, mosaic law, muckle, mezcal, mucosal, moselle, missal, meningocele, maxwell, maniacal, miniscule, monomaniacal. movie, film, motion picture, play, picture, motion-picture show, pic, picture show, moving picture, moving-picture show, flick.